Place a large fry-pan over high heat an add 1 tablespoon of oil. 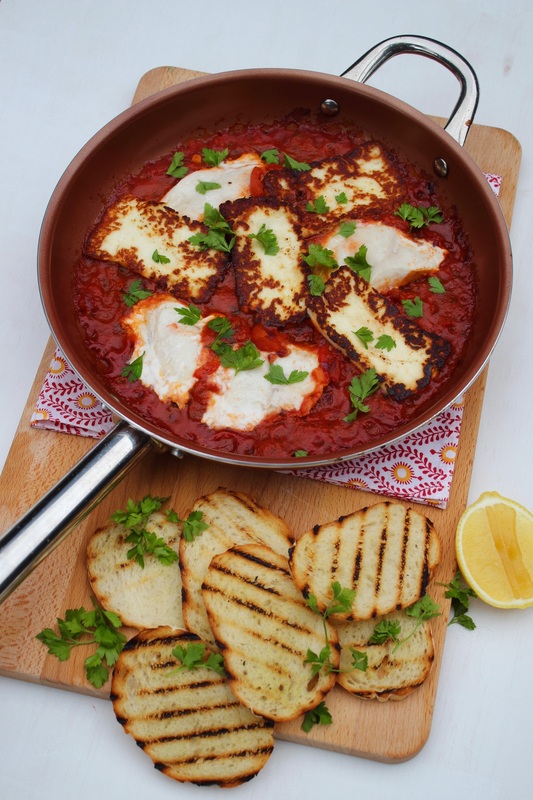 Add the haloumi in a single layer, and cook for 2 minutes on each side, or until golden. Remove from the pan and set aside. Place the fry-pan back on medium heat. Add 1 tablespoon of oil and the onion, and cook for 3 minutes, stirring occasionally. Add the chilli and half of the garlic, and cook for a further 3 minutes. Add the tomatoes, oregano, and a big pinch of salt and pepper. Once boiling, turn the heat to low and cook for 10 minutes. Add the flake fillets to the pan, and push into the sauce until covered and in a single layer. Simmer for 5 minutes. Place the haloumi on top of the flake, and cook for a further 2 minutes, or until the flake is cooked through. Whilst the fish is cooking, mix the remaining oil and garlic in a small bowl with a pinch of salt. Brush over the sourdough slices. Heat a griddle pan over high heat, and toast the sourdough for 2 minutes on each side, or until slightly charred. Once the flake is cooked, sprinkle with parsley to serve.